Every summer, the halls of Theory and Computing Sciences Building at the U.S. Department of Energy’s (DOE) Argonne National Laboratory are a little noisier. Previously empty workspaces are suddenly occupied and the communal fridges become prime real estate for lunch bags of every shape and size. This is all due to the presence of the more than 150 summer interns in the lab’s Computing, Environment, and Life Sciences directorate—including 45 students (like me!) hired by the Argonne Leadership Computing Facility (ALCF), a DOE Office of Science User Facility. 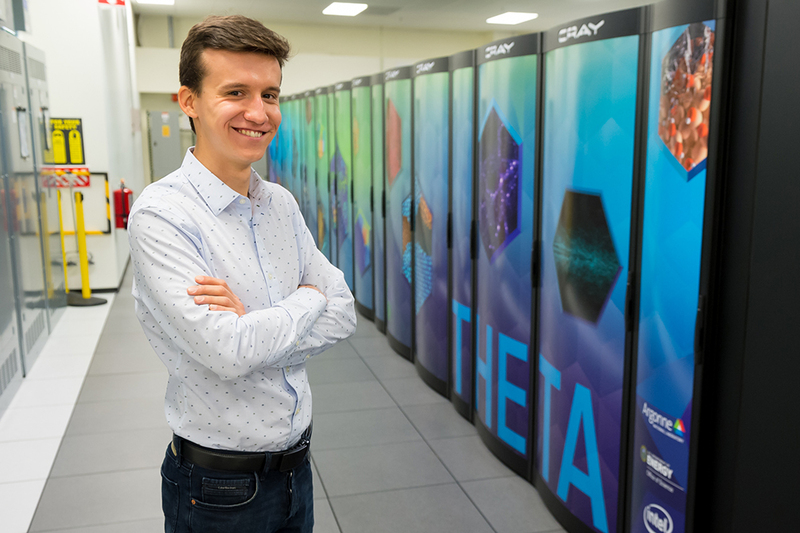 This year, the ALCF interns ranging from undergraduates to Ph.D. candidates came from all over the country to gain hands-on experience with some of the most powerful supercomputers in the world. 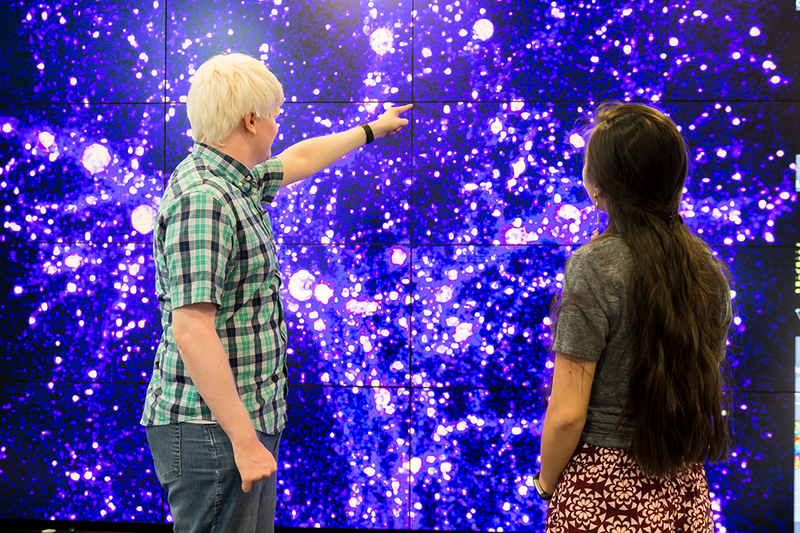 From exploring the potential of quantum computing to visualizing system logs of high-performance computing (HPC) systems, this year’s intern class worked alongside ALCF staff mentors to tackle research projects that address issues at the forefront of scientific computing. Keep reading to learn more about four of these students and their summers at the ALCF. As we approach the limits of silicon scaling and Moore’s law—the prediction that the number of transistors that will fit on integrated circuits doubles every year—it’s important that we start researching ways to address these issues. That’s just what Ruslan Shaydulin, a Ph.D. student in computer science from Clemson University, worked on this summer. Quantum computers are potentially capable of exponential speed-ups over the best-known classical algorithms for certain problems. Near-term noisy intermediate-scale quantum (NISQ) devices, however, are very limited in their ability to realize the quantum advantage. Shaydulin’s summer project with the ALCF focuses on trying to take advantage of those near-term NISQ-era devices to solve real-world problems. For example, graph modularity clustering is a technique that can be used in applications such as constructing gene co-expression networks, which have the potential to help with the distribution of pharmaceuticals in the body. To improve the quality of clustering, Shaydulin developed a hybrid algorithm that leveraged a quantum approximate optimization algorithm for solving small subproblems. Classical and quantum parts of the algorithm work in tandem, with the quantum part solving the subproblems that are particularly hard for classical computers. Shaydulin also contributed to grant proposals and a paper submission to a Post Moore’s Era Supercomputing workshop at the upcoming International Conference for High-Performance Computing, Networking, Storage, and Analysis (SC18). He says that working at Argonne has helped him see the benefits of working in a collaborative environment. This isn’t the first ALCF experience for Shilpika, a Ph.D. student from the University of California Davis. Previously, while working towards her Master’s degree at Loyola University in Chicago, Shilpika used Cooley, the ALCF’s data analysis and visualization cluster, for her research investigating how to make computations with big data run faster. After graduating in 2016, she was a pre-doc at the ALCF for almost a year. 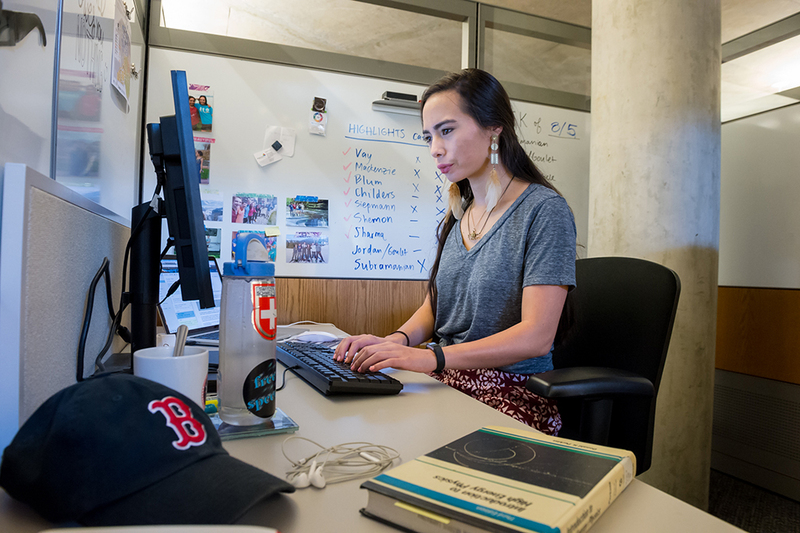 This summer, she is back to help develop an effective, interactive, and intuitive way to better understand the performance and monitoring data from supercomputers. To maintain robust and reliable HPC systems, it is necessary to understand the various system events and failures occurring on supercomputers. This can be done on supercomputers like Mira and Theta by analyzing system logs such as environment logs, job logs, and error logs. For a facility like the ALCF, it’s important to understand how these different events correlate and try to identify and predict patterns to improve operational efficiency of the computers. 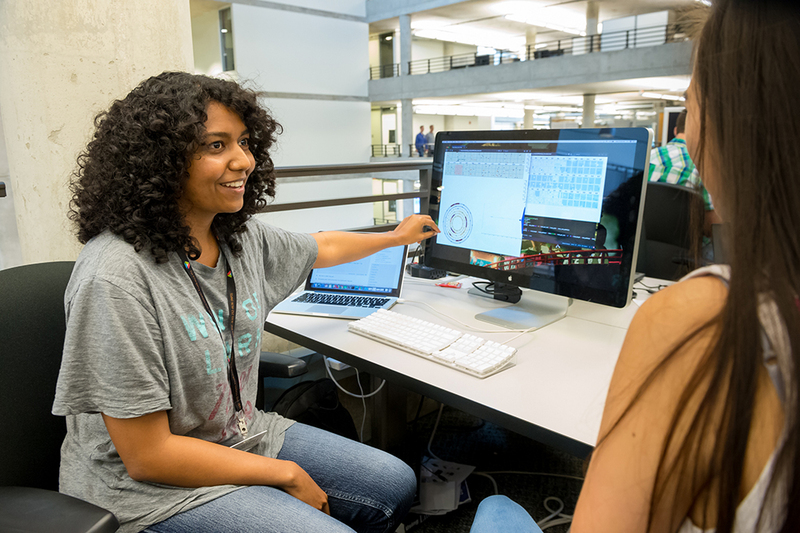 This summer work with the ALCF relates to Shilpika’s thesis project at UC Davis where she wants to build a visualization toolkit using machine learning. She expects to collaborate with the ALCF throughout the PhD process. 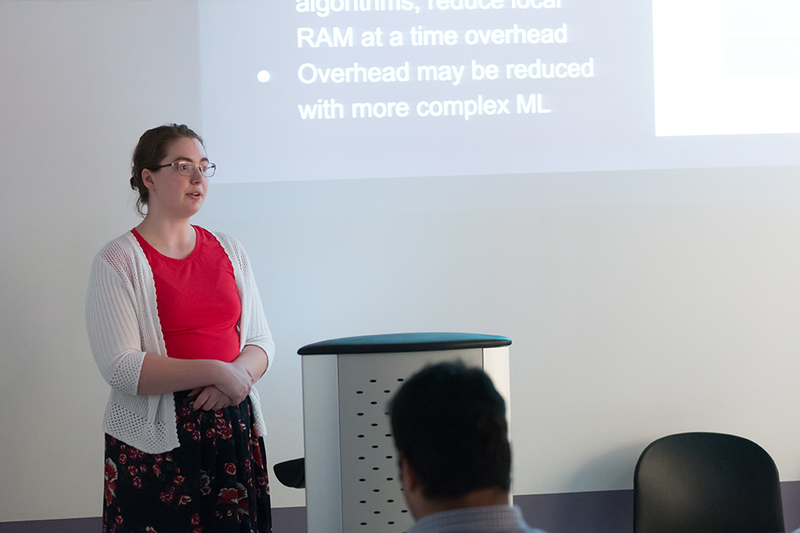 Melanie Cornelius, a Master’s student in computer science at the Illinois Institute of Technology, spent her summer at Argonne testing machine learning on the ALCF’s RAM Area Network (RAN) project, which is working to minimize cost and optimize resource utilization for supercomputers. In current datacenter designs, processors and memory are tightly coupled. But a job’s processing and memory requirements frequently don’t match the proportions chosen for nodes. On Cooley, this means many nodes have significant amounts of underutilized RAM. To solve this issue, RAN treats RAM as a schedulable, de-coupled resource. Specialized hardware called XPDs are connected to Cooley. They contain a pool of RAM which can be allocated to users, and each node can use its local RAM as a cache for the remote memory. “Basically, it's a potential way to decrease the cost of building a supercomputer by requiring less per-node RAM while increasing its utilization statistics,” says Cornelius. Cornelius’s project works toward understanding the performance relationship between properties of machine learning and RAN’s configurable, disaggregated memory. Ultimately, she would like to determine if and how machine learning might be made more performant at very large scales when using disaggregated memory. While she has some preliminary results, the project is ongoing, and Cornelius is still running tests. She submitted a poster to SC18 and plans on submitting papers for publication later in the year. Cornelius says that this ALCF experience “has completely changed everything” about the direction of her academic and career paths. Effectively communicating science is paramount for the advancement of discoveries and the continuation of scientific research. At places like Argonne, where funding comes from the United States government, it is even more important to be able to talk—and write—about science in ways that are clear and accessible to non-scientists (and taxpayers). Madeleine O’Keefe (that’s me!) addressed this in her internship with the ALCF communications team this summer. I just finished up my Bachelor’s degree in astronomy at Boston University in May, but I will be returning in the fall for a one-year Master’s program in science journalism. This internship was an amazing opportunity to experience science writing in a new context—a national laboratory. Unlike the other interns who had specific research problems to solve, I contributed to various outreach projects within ALCF communications, including writing one-page summaries of projects that use ALCF computing time. These “highlights” will be used for the ALCF’s annual Science Report. While it was often challenging to condense nuanced and esoteric science projects into a small space, I enjoyed learning about the huge range of science that is enabled by the facility’s computing resources. In addition to the highlights, I wrote three feature articles (including this one) for the ALCF website. One was about the CodeGirls@Argonne  program, a two-day summer camp geared at immersing middle school girls in computer science. Another, describing the collaborative efforts between CERN’s ATLAS experiment and scientists from the ALCF. For me, one of the biggest takeaways from this experience is the reinforced idea of the importance of being able to communicate science clearly. Whether at a national lab or an elementary school classroom, whether it’s a 300-word story or 3,000, effective science communication is essential to the future of research and institutions like the ALCF. Argonne National Laboratory seeks solutions to pressing national problems in science and technology. The nation’s first national laboratory, Argonne conducts leading-edge basic and applied scientific research in virtually every scientific discipline. Argonne researchers work closely with researchers from hundreds of companies, universities, and federal, state and municipal agencies to help them solve their specific problems, advance America’s scientific leadership and prepare the nation for a better future. With employees from more than 60 nations, Argonne is managed by UChicago Argonne, LLC  for the U.S. Department of Energy’s Office of Science . The U.S. Department of Energy’s Office of Science is the single largest supporter of basic research in the physical sciences in the United States and is working to address some of the most pressing challenges of our time. For more information, visit the Office of Science  website. ALCF summer students worked alongside staff mentors to tackle a wide variety of research projects. This year's students included (from top to bottom) Joseph Adamo, Shilpika, Ruslan Shaydulin, Madeleine O'Keefe, and Melanie Cornelius. 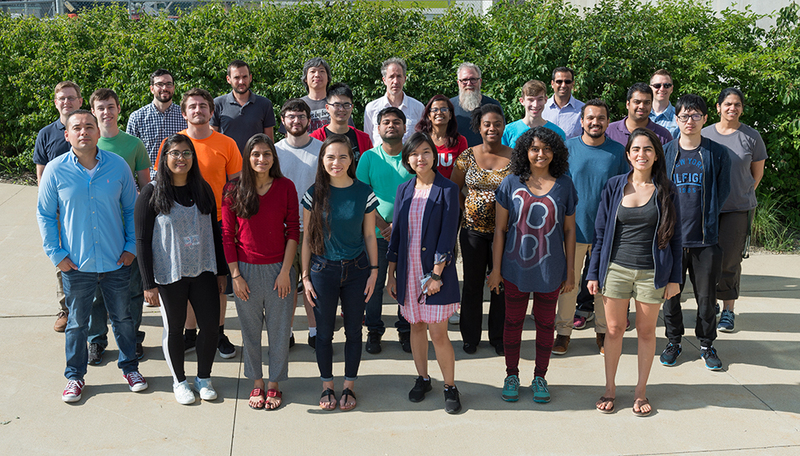 A group of ALCF summer students and staff mentors gather in front of Argonne's Theory and Computing Sciences Building (bottom).